Alphabet stock reversed its morning selloff and rallied 1.16%, and the Russell 2000 was up 0.18%. Google’s TAC payments to Apple represent about 23% of Apple’s services revenues. The S&P 500 is now up 9.21% year to date. One key reminder is profiting off stocks on the long side isn’t ‘easy money.’ Many prognosticators proclaim the easy money is made after strong rallies. Being long stocks in 2019 wasn’t easy money because of the volatility in Q4 2018 and the economic uncertainty. 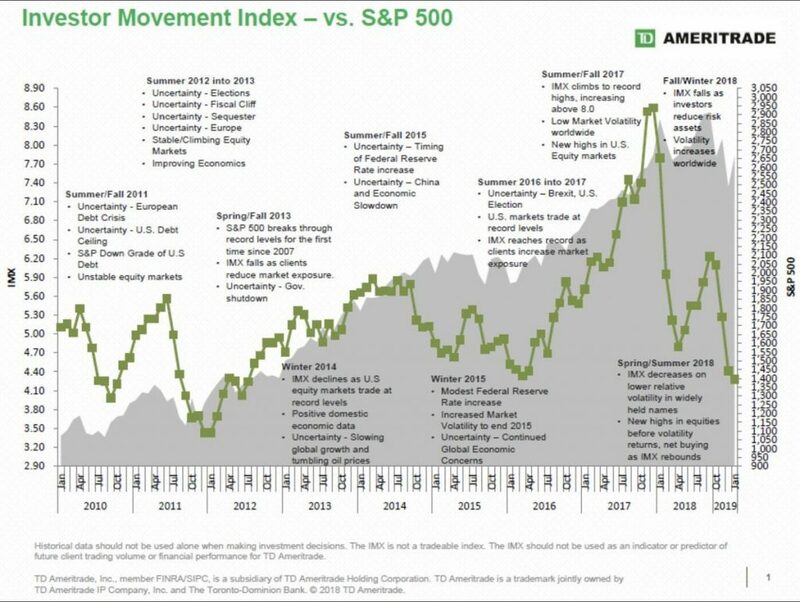 As you can see from the chart below, the TD Ameritrade movement index for retail investors fell from 4.41 to 4.28. Retail investors didn’t profit off this rally. That’s good news for the stock market. However, that doesn’t mean stocks will rally until retail investors get bullish. I still expect a pullback. The stock market is clearly overbought. Even though stocks rallied on Tuesday, the CNN fear and greed index was stable at 64 which signals greed. The 14 day RSI increased to 74.86 which puts it more than 4 points above the level traders consider overbought. As you can see from the chart below, the number of stocks trading above their 50 day moving average is the highest since January 2016. I never thought any indicators would surpass the extreme level at the start of last year in this cycle. However, optimism still isn’t close to that level. This rally has been met with skepticism. 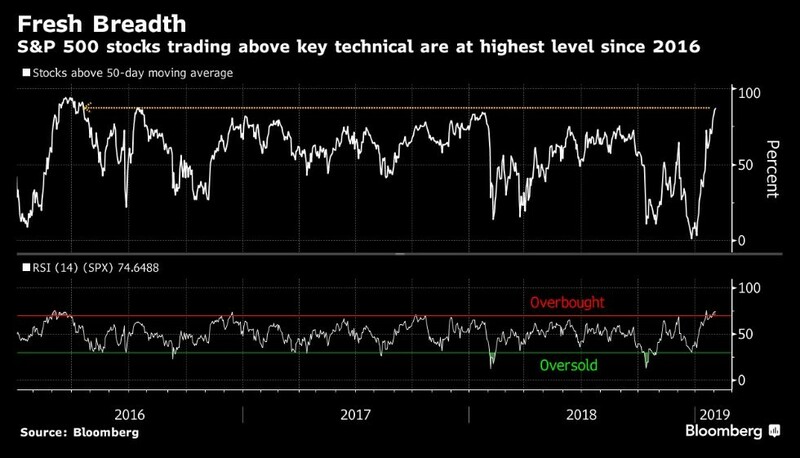 The net percentage of overbought stocks in the S&P 500 hit 51.4% which is the highest since last January. On Tuesday, the two best sectors were consumer discretionary and communication services as they increased 0.96% and 0.91%. Facebook being up 23.98% in the past month helps the communication services sector a lot. At the bottom, Facebook stock was down 42.96%; now it is only down 21.31%. I think it will make a new record high this year. The worst 2 sectors were financials and healthcare which fell 0.14% and 0.08%. Redbook same store sales growth results have been the exact opposite of the stock market. Same store sales growth hit record highs in December when the stock market was plummeting. Growth was about 9% in December. In the past few weeks, growth has slowed as stocks have ramped higher. The last report is a continuation of the recent weakness as the week of February 2nd saw same store sales growth fall from 5.8% to 5.7%. This is the slowest growth since mid-September. Month to date sales are down 2% which is the weakest growth in over one year. Full month year over year growth fell 0.2% to 6.3%. Nothing makes stocks cheaper than falling prices and high earnings growth. That combination in 2018 caused the S&P 500’s forward PE ratio to fall to 13.92 at the start of 2019. As the table below shows, the recent rally in stocks and decline in earnings estimates has pushed the S&P 500’s forward PE ratio to 15.39. FactSet now estimates Q1 2019 earnings growth will be -0.8%. Usually earnings results beat estimates, so growth would probably be positive if earnings season started now. However, we’re still in Q4’s earnings season. Q1’s earnings season doesn’t start for about 2 months. At the current pace of declines, earnings will fall in Q1 as estimates were for above 4% growth about 2 months ago. The Earnings Scout’s numbers are a bit better as they show Q1 earnings growth will be 2.29%. However, that’s down from 6.26% at the start of December. November month over month factory orders were down 0.6% which missed estimates for 0.2% growth. Orders declined 2.1% in October. Yes, we are still reviewing data points from November because the shutdown delayed this report’s release date. I think the Q4 GDP report will be released in March if there isn’t another government shutdown. I’m not hopeful the government will avoid a shutdown. Both sides said they don’t want a shutdown. However, 2 days ago, President Trump stated, “we’ll have to see what happens on February 15th.” It’s not ideal to wait until the last day to make a deal. The decline in oil prices contributed to factory order growth falling below the low end of the estimate range. Non-durable order growth was -1.9% because of the decline in prices. The 0.6% decline in non-defense ex-aircraft new orders for capital goods suggests November was a weak month for the economy. Even with this weakness, Q4 GDP growth is expected to be somewhere between 2.3% and 2.8%. Overbought Stocks - +2% GDP Growth In Q1 2019? NY Fed is the only regional Fed with a model for Q1 GDP growth. Normally, at this point in the quarter, all the models would be publishing Q1 estimates. The NY Fed Nowcast as of February 1st is for 2.39% growth. If the government shuts down again, growth could end up being below 2%. It will be ignored because in theory government shutdowns are temporary. Obviously, they don’t look temporary now as the last shutdown was the longest in history and another one is headed our way next week. The stock market is very overbought. Retail investors haven’t participated in the great rally this year. That doesn’t mean stocks can’t fall. Stocks are starting to become expensive again because earnings estimates are collapsing. November factory orders were weak, but Q4 GDP growth will be above 2%. Redbook same store sales growth is decelerating. It will start to be a major problem when growth falls below 5%. If stocks fall, it will be less of a problem because the negative change will be priced in. Q1 GDP will be hurt by the government shutdown, potentially pushing growth below 2%.